I'm here in Argentina now! It's super hot, usually between 94 and 105 every day. And there's no air conditioning anywhere. If I don't get anything else out of this mission, at least I know that everyone back home has a cushy life haha. 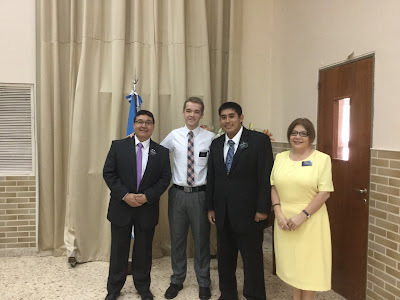 My trainer is Elder Huerta and he's from Ogden (his parents are from Mexico and Guatemala). Go to the mission blog for pics. Also, I was super busy getting all situated this week, so sorry I don't have a ton of pictures. Anyways, we started proselyting right away. It's really hard here, because nobody wants to set appointments, they just say, oh, I should be around this time of the day, and then half the time when we go back they're not there. As far as investigators go, we don't really have many. We have two who really want to be baptized, but can't because their maridos don't want to get married, and there's not much we can do about that. We did find two new investigators yesterday, though, and one seems promising! His name is Juan, and he strongly believes in being a good person and in following Jesus Christ. It took us about an hour and a half to get through the basics of the Restoration with him, though, because every time we asked him a question he would talk for about 10 minutes non stop haha. But he's concerned with all the bad in the world and how all the youth nowadays aren't very responsible and spend all their time being disrespectful and doing dumb things. He's worked hard all of his life. Right now he doesn't seem to really want to do anything different, but he's pretty interested our message, so hopefully that goes well! I played piano in church because nobody plays in this ward. The ward/our area is called Terminal (no idea why). There's about 40 active members, so it's not super big. There's this one guy in the ward, I can't remember his name, but he's the counselor to the Elder's Quorum President and he's about 50. He's super active in the church, and I love him a lot. He can quote General Authorities all day long, it's so cool! I wish I was like him. The people here are ridiculously hard to understand. I understood pretty much every spanish speaker in the MTC, but I got here and I could've sworn they were speaking a different language. I've just gotten really good at smiling and nodding and pretending to know exactly what they're saying. The area we're in is just outside of the center of Paraná. We're in a poorer part of the suburbs, because that's where most of the members live. There's dogs everywhere, and dirt everywhere too. But the food is really good, so that´s good. It's kind of weird never eating in the night time, but the lunches are always really good. Anyways, not really any time left, so I just want to leave you all with the this thought: Repentance is everything. Repentance is the purpose of the gospel. I know it. It is through repentance that we receive help, deliverance, everything! Every time in the scriptures someone wants help, they have to repent first. We have to repent in order to receive anything from God. So repent all of you! Every day! Multiple times a day! And I'll do it with you, because I definitely need to repent of a lot of things. Anyways, ciao!